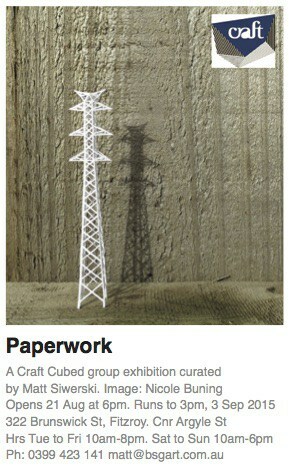 PAPERWORK @ Brunswick Street Gallery 21st August – 3rd September 2015 In association with Craft Victoria and their annual festival Craft Cubed. In conjunction with Craft Victoria, Brunswick Street Gallery is holding a Satellite Event that centres on paper craftspersonship entitled Paperwork. Focusing on the materiality and labour of craftwork and art creation, Paperwork is an opportunity for artists to demonstrate their skill and new perspectives with paper. Vastly used and mass produced, paper is the humble bearer of core communication such as written word, design, and visual arts. As well as bulk material for industrial, medical, household and recreational purposes. How has paper been manipulated to serve as an artistic expression in itself? What are the new ideas and issues arising with the material? Especially with increased environmental concern and the digital age of production. A group of local and interstate artists demonstrate their knowledge and skill with the medium. Brunswick Street Gallery fosters emerging and developing artists to come together and present an exhibition that places craft as the leading practice of contemporary production. Through doing so, this exhibition seeks to strengthen new ideas and exchange.